Duterte must be held responsible says NDFP leader | Fight Back! Luis G. Jalandoni, Senior Adviser, Negotiating Panel, of the National Democratic Front of the Philippines. Distinguished Jurors of the International Peoples’ Tribunal on the Philippines, Claimant People’s Organizations, Lawyers, Solidarity Guests, Ladies and Gentlemen. One of the biggest opportunities, if not the biggest, for President Rodrigo Duterte to serve the Filipino people is to foster the peace negotiations. This could not only solve the almost 50 year-old armed conflict but also lay the basis for responding to the deepest aspirations of the 75 million peasants for land and the entire nation for justice, democracy, progress and lasting peace. On November 22, negotiators of the government were with us in Utrecht. Bilateral teams of both Parties had met several times earlier in the month and completed and initialed the bilateral agreements on Agrarian Reform and Rural Development (ARRD) and National Industrialization and Economic Development (NIED), the first two major parts of the Comprehensive Agreement on Social and Economic Reforms (CASER). Both Parties were preparing for the resumption of the GRP-NDFP formal talks on November 25-27, 2017. “We are being ordered to go home!”, so sounded the heartbreaking news from Secretary Silvestre Bello and Hernani Braganza of the GRP Negotiating Panel. The proclamation on November 23 (Proclamation 360) was followed by President Duterte’s declaration of the Communist Party of the Philippines (CPP) and the New People’s Army (NPA) as terrorist organizations on December 5, 2017 (Proclamation 374). This was followed in February 2018 by the proscription by a Regional Trial Court of more than 600 individuals as officers, members, and supporters of the CPP and NPA. Despite these crushing blows, the NDFP agreed to hold back channel talks with the GRP from March to June 2018. On June 9, 2018, the GRP Panel Chairperson, Silvestre Bello signed together with NDFP Panel Chairperson Fidel Agcaoili the Stand Down Agreement. This would be announced by both in Manila on June 15. This is the initial Ceasefire that would develop into a Coordinated Unilateral Ceasefire (CUC) that would in turn lead to a Bilateral CF. The back channel talks also agreed to have the Amnesty for all (503) political prisoners to be done at the scheduled resumption of formal talks in Oslo on June 28! Alas, on June 15, after attending a meeting of the top military and police officers, President Duterte cancelled the talks, stating that he needed to review all the past agreements, and consult the public. Defense Secretary Lorenzana rejected the Stand Down Agreement, claiming that the NPA would take advantage of it. Duterte declared that talks must be held in the Philippines, the CPP-NPA must stop revolutionary taxation, and the NPA be put in encampments. These demands of Duterte are of course rejected by the NDFP. These in effect call for the surrender of the revolutionary movement. Already in The Hague Joint Declaration of 1992, surrender or capitulation is excluded. This agreement declares that no precondition shall be made to negate the inherent character and purpose of the peace negotiations. Other major achievements followed The Hague Joint Declaration. The Joint Agreement on Safety and Immunity Guarantees (1995) provides safety and immunity to all participants in the peace talks. Then, the Comprehensive Agreement on Respect for Human Rights and International Humanitarian Law (CARHRIHL,1998) was signed. and the Joint Secretariat (JS) of the Joint Monitoring Committee (JMC) under CARHRIHL was formed in 2004. The JS holds office in Metro Manila, with staff members nominated by both Parties. The JS assists the JMC which monitors the implementation of CARHRIHL. In accord with The Hague Joint Declaration, work on social and economic reforms, political and constitutional reforms, proceeded. Both Parties would aim to attain the End of Hostilities and Disposition of Forces which would work for a General Amnesty for all combatants of both Parties. After Duterte won the elections in May 2016, the hopes for the success of peace talks were very high, perhaps higher than ever before. He promised to amnesty all political prisoners on May 16, 2016. In August 2016, he released 21 NDFP Consultants to join the peace talks. Also in August 2016, the GRP and the NDFP reaffirmed all past peace agreements. At the end of the August talks, the longest simultaneous unilateral ceasefires were held for five months from August 2016 until January 2017. In January 2017, the third round of formal talks resulted in an agreement to distribute land free to the farmers, a landmark advance in land reform. During this period, however, extrajudicial killings started to multiply in Duterte’s so-called war on drugs. The CPP issued a strong statement in August 2016 condemning the anti-people and anti-national policies of the Duterte government. The CPP denounced the ceaasefire violations of the AFP and PNP in more than 500 barangays in 43 provinces, declaring that these were rendering the ceasefire untenable. Hence, on February 1, 2017, the CPP announced that it would terminate its unilateral ceasefire in ten days. Duterte went wild in cancelling the talks. He ordered his troops “to flatten the hills”and Defense Secretary Lorenzana declared “All Out War” against the CPP-NPA. 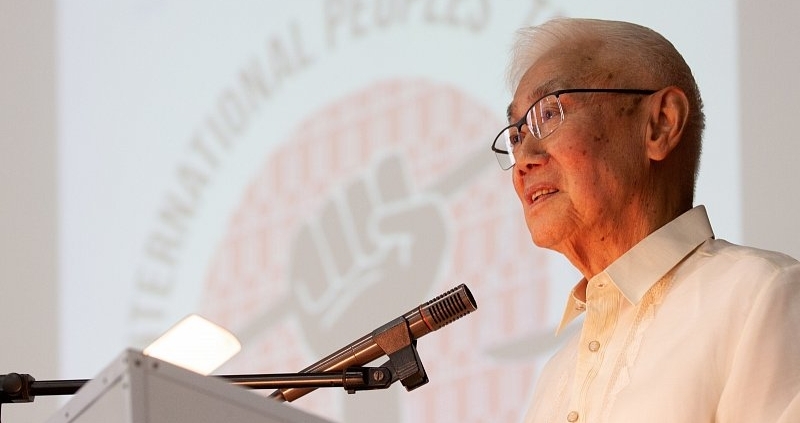 NDFP Chief Political Consultant, Prof. Jose Maria Sison enjoined President Duterte to engage in back-channel talks. These took place in Utrecht on March 11-12 and both Parties agreed to a ceasefire on March 31 and hold formal talks on April 2-5 in Oslo. The CPP was ready with its ceasefire declaration, but Duterte refused to issue the GRP ceasefire, claiming that the NPA had launched a military operation. The scheduled formal talks got postponed and then proceeded but could not make any advance. This pattern of on again, off-again has continued until Duterte’s cancellation of the talks last June 15. His volatility in the peace talks was accompanied by horrendous human rights violations amounting to mass murder of tens of thousands of victims of his drug war. Numerous killings of Lumad and other indigenous and mass organizations suspected as supporters of the NPA were perpetrated by the regime. Hundreds of attacks against Lumad schools and forced evacuation of Lumad communities ensued as the military encamped in their barrio halls, health centers, schools and even residences. The economy deteriorated with laws favoring the rich and causing big losses to the poor who are subjected to skyrocketing prices of basic commodities. Workers are still plagued with contractualization despite his promise of eradicating it. Striking workers and their supporters are subject to military attacks as in Nutriasia. Massacres of civilians and non-combatants continue to be perpetrated by the military and police as in the case of the Anique Seven on August 15, 2018 and the Patikul Seven a few days ago. The killings of priests has aroused condemnation from Church leaders and the public. Solidarity persons like Sr. Patricia Fox and Lawyer Gil Boehringer of Australia are subjected to deportation and other violations of their rights. The grievous crimes of President Duterte and his government against the people, including his sabotage and destruction of the peace negotiations, are compelling proof that he must be held accountable.